1860 United States Federal Census, Cedar County, Nebraska Territory, Population Schedule, Page 907, dwelling number 208, family number 120, John Brooks household; digital image, Ancestry.com (http://www.ancestry.com); citing National Archives Microfilm Publication M653, Roll 665. This family was indexed as Brooks by Ancestry.com, but it is the John Brocke family - the first four children are given in the same order in the 1870 and 1880 census records and in other family records. 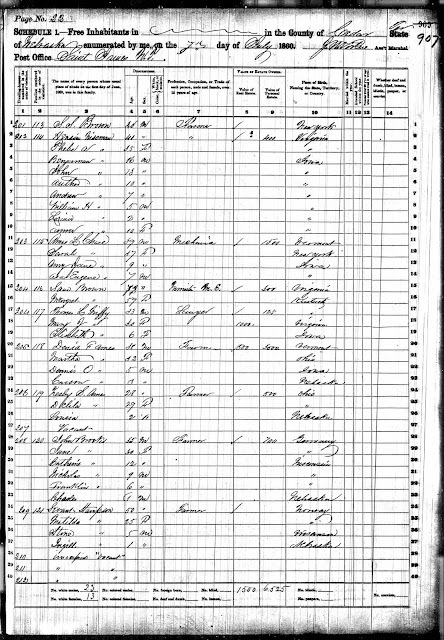 The later census records have John Brocke's wife's name as Christina, and not Jane. It could be that Christina is the second wife of John Brocke, married after 1860 and before 1870. John Brocke (1826-1891) is my wife's 2nd great-grandfather through his son John Nicholas Brocke (1855-1938) who married Anna Grieser in 1877 in Cedar County, Nebraska.